Chances are by now that your kids are back in school, and everyone is adjusting to the chaos that is getting back into the rhythm of a routine. 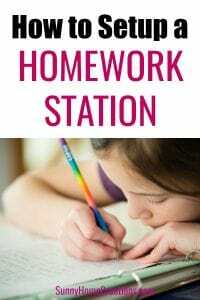 One thing that helps immensely is having a dedicated homework station for your child. That way, he/she comes home from school, has everything they needs at hand, and you can avoid the procrastination that comes with searching for school supplies and necessary items! 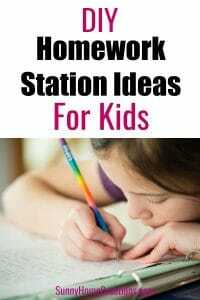 Here are a few simple things you can use to create a DIY homework station for kids. This all-purpose organizer makes the perfect caddy to hold all of your child’s homework necessities – pencils, crayons, scissors, etc., complete with reusable and removable chalk labels and a chalk pen for labeling! The best part? This will blend in with your home decor and won’t look like it belongs in an elementary school. 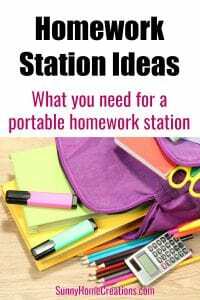 I especially love how it has a handle, so if your child does not have their own desk area and uses, say, the kitchen table to complete their homework, he/she can simply pick up the caddy and move it to their homework location. You can pick up this caddy here. This weekly calendar is the perfect way to help your child with organization. It’s both magnetic *and* dry erase, so you and your child can easily update it with the week’s commitments. Additionally, I love how this particular calendar has a cork board at the bottom for displaying artwork, good grades, and more! Okay, it’s obviously a no-brainer to stock your child’s homework station with pencils, but sharpening a million pencils is basically the worst. So. do yourself a favor and grab these pre-sharpened pencils and throw them in your caddy without a second thought! That being said, eventually, your kiddo *will* have to sharpen those pencils, so do yourself a favor and snag this brilliant sharpener that has a screw-on top. 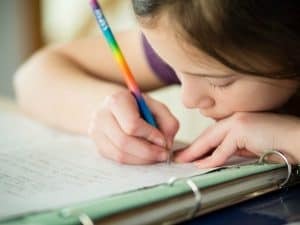 Breathe in, breathe out, and relax in the knowledge that your child will finally not be accidentally dumping pencil shavings all over your house. Dress up those simple pencils with these awesome emoji pencil top erasers! Your child will love coming home and seeing these adorable emojis hanging out on top of their pencils. Plus, these erasers actually work effectively – a huge plus for novelty erasers! Since you get a whopping 18 erasers for the price, you can package some extras up and give them as birthday presents once the inevitable party invitations start streaming in. One thing I always find surprising is how many school projects seem to involve glue sticks – and how quickly kids go through glue sticks in the first place! It’s always a good idea to throw one in the homework caddy and keep the extras stored nearby. You can’t go wrong with Elmer’s glue sticks, and the disappearing purple glue magic ensures your kiddo always knows where they’ve applied it! Snag this amazing Crayola Kit for your kids and you’ll know they will always have the proper materials nearby for whatever project they are working on. This kit includes 64 crayons, 10 washable markers, 10 stamper markers, 10 bold washable markers, 16 metallic crayons, 8 neon crayons, and – just for funsies – a sketch pad! You can store all of these goodies in your homework caddy so your child can easily access them without having to ask for help. You can pick up this kit here. Fiskars makes just the best scissors, and these kid scissors are no exception. Make sure you always have 1-2 pairs of these on hand for your children to use for homework and school projects! If you have an older child, graduate to these Fiskars Student Scissors! I’m unable to insert an image for this timer, but it is really a brilliant way to help your child understand the passage of time. Instead of having to constantly answer the question “how much longer?” your child can start visually understanding how long things take. This is especially great to help kids who have trouble concentrating or focusing on completing a task. Set this up at their homework station to help with reading goals and more. For children who might have sensory issues, please note that this timer is quiet and does *not* tick down. Instead, when the time is up, a quiet beep can be heard. You also have the option of turning the beep off entirely and just focusing on the visual aspect of the timer. Pick up this amazing timer here. This is obviously a bigger-ticket item, but the older your child gets, the more they will use technology both in and out of the classroom. This Chromebook is affordable, durable, and can convert to a touchscreen tablet for ultimate versatility. I highly recommend snagging your child an affordable Chromebook so that they aren’t always wanting to use your MacBook Pro or other expensive electronics! Throw together these items in your homework station and you are guaranteed to alleviate some of the angst that comes with getting homework done daily.